If you pay for railcar repair bills, I’m going to show you how to save a minimum of $600 each year. Starting January 1, 2012, Railinc will begin charging $600 annually for the PDF print out of [rail]car repair billing charges (CRBX Data Exchange) to billed parties. The charge is actually per each profile ID, so if your company has multiple IDs, you will see multiple $600 charges. Plus, third party companies wishing to receive the PDF report on behalf of customers must contact Railinc for a quote. Finally, if a company asks a billing party for a printed detail repair invoice, the billing party may charge a $150.00 per invoice fee per AAR (Association of American Railroads) Office Manual Rule 113.1.d. NOTE: PLEASE CLICK THIS LINK FOR A MORE RECENT REVIEW OF THE LATEST VERSION OF THE SOFTWARE TOOL MENTIONED IN THIS ARTICLE. The tool is Invoice21 by RailTech Software Systems. Installing the tool is a multi-step process and is a bit more involved than your typical software install, but if you follow the instructions exactly, you shouldn’t have a problem and will be using the tool within 30 minutes or less. If you do run into a problem, RailTech will offer help for no charge – how to get in touch with them is very clear on their website. After installing the tool, I imported a fairly large monthly file (1,024 records) in only 20 seconds. Invoice21 will save one month’s worth of data. It will erase the prior month before importing a new month. If you want to maintain more history, you will need to look at the Rail21 system, which requires a license fee that is listed on the RailTech website. 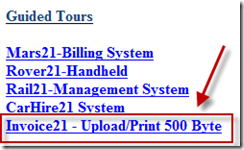 There are four reports provided by Invoice21 plus an error report. There was one error in my file and I was impressed with the tool’s ability to pinpoint the location of the error. The other reports show 1) invoices only 2) each repair (billing repair card) by railcar and its cost 3) repairs by shop and 4) repairs that were done in groups. Invoice21 does not provide the ability to export your reports directly to PDF. For that you will need to have a utility that enables you to print-to-PDF. There are several of these available for free such as PrimoPDF. You will be taken to a page where you can read about the Invoice21 product. Click on the Updates link in the third paragraph or on the left side of the page. This will take you to the Updates and Upgrades page; click on the 32 Bit Runtime Engine Build 2181 link as shown below. Click Run when prompted. If it looks like nothing is happening, minimize the browser window and you will see the install program running – just follow the instructions given. This will install the database engine that powers the application. Once the engine is installed, open your computer’s Control Panel and open the BDE Administrator. Using Windows XP, I was able to find the icon for the BDE Administrator easily in the Control Panel list of icons, but with Windows 7 I couldn’t find it. To run it, I clicked on my computer’s Start button and then typed “bde” in the Search text box. The icon appeared on the menu and I simply clicked it to launch the program as shown below. 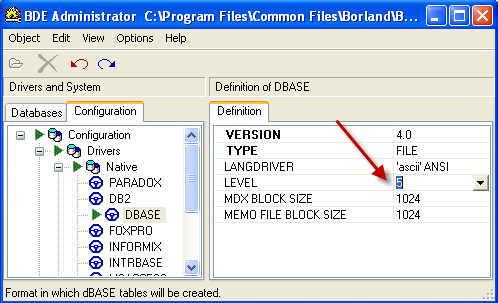 Once you have the BDE Administrator open, click on the Configuration tab next to the Databases tab. 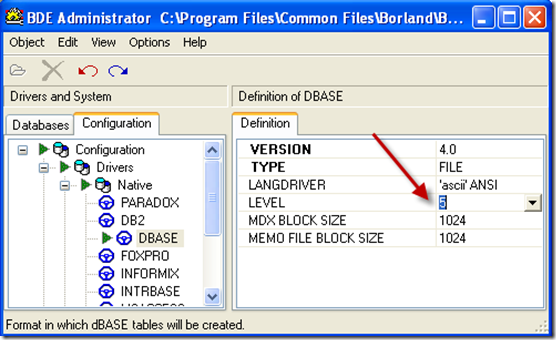 Click on Drivers then Native then DBASE. On the right you will see a line for Level. Change the setting from 7 to 5, then click on the next line to set it. Now exit the screen. The system will ask if you want to save it, state Yes. You are now ready to install Invoice21. Create a new folder on your desktop called Invoice21. Go back to your web browser and you should be looking at the Updates and Upgrades page; on the left click the Invoice21 link – it will take you to the Invoice21 Updates and Upgrades page. In the middle of this page, you will see a link for the invoice21.zip file – click on this link and save the invoice21.zip file in the Invoice21 folder that you just created. Open the folder and right click on the invoice21.zip file and select Extract All. A new folder within the folder you created will be created that holds the program files. To start the program, open the Invoice21 folder and double-click on the Inv21.exe file and click Run if prompted with a security warning. It will prompt you for a key. Email information@railsoft.com for a key. The folks at RailTech Software Systems say that there are no strings attached to the software, it is totally FREE and they won’t spam you. Once you have started the program and entered the key, you will want to import a 500 byte file. 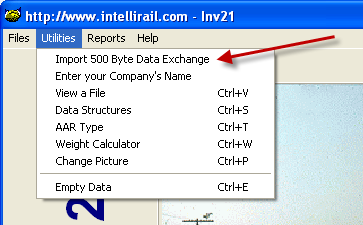 To do this, click on the Utilities > Import 500 Byte Data Exchange menu. After the file is imported, run your reports by clicking on the Reports menu. To print the report to PDF, you will first need to install a print-to-PDF utility (PrimoPDF) and set it as the Default printer in Windows. You MUST do this because Invoice21 doesn’t give you the ability to choose a printer; when you click on the Print Report button, it automatically routes the report to the Windows default printer. That’s it. Something that won’t take you more than a Friday afternoon to master, will save your company $600 or more each year! These days, that is not too shabby. If this benefitted you, subscribe to this blog to get notifications of when new articles are posted and forward a link to a friend. Please leave a comment and let me know how Invoice21 worked for you. Hi Jim, thanks so much for finding this tool. I emailed the software company for my key to unlock Invoice21 yesterday but haven’t received it yet. Do you remember how long it took you to get your key? I work in A/P and our rail car repair bills are only about $60 a month but of course we’d like to see what was actually repaired and how much is labor vs. material for NJ tax purposes. If we had to pay $600 a year just to see the backup for those invoices, it would double our cost. I can’t wait to receive my key so I can try out the software because I have a 500-byte test file waiting in the wings to try it out. I’ll let you know after I get my key how it goes. Please go to our website, http://www.railsoft.com , and select Updates then Invoice21. Click on invoice21.zip, open the file and extract all files to the directory where the program is located. If you have data in the invoice21 program, this upgrade will delete it. You will also need to enter your company’s name again under Utilities. We now give you the ability to query your file based on anything you want, such as a specific company, invoice, month, job code or combination of anything. We have also added a complete manual on how to perform queries. Another feature that we have added is a summary of all the job codes plus qualifiers. Each job code with qualifier shows the total line count, total quantity, total labor, total material and total amount. At the end of the report is the grand total of all items. We hope that these new features will enhance your appreciation for our products and services. If you ever have any questions, comments or suggestions, please let us know. I got my key for Invoice21 and tried importing my CRB 500-byte test file from RailInc and it worked beautifully! I can’t thank you enough for posting it. You are very welcome, Cindy. I’m glad it worked out for you. So if I understand the concept, I pay $600/year and railing does it all for me or I pay $400 a year & rail tech allows me to do it myself? 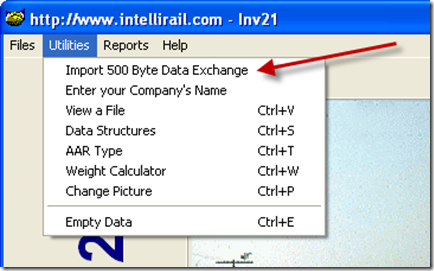 Invoice21 is a free software available from RailTech Software Systems (railsoft.com). There is no $400 fee that I am aware of. I checked their website just now and it has a link to download and use Invoice21 for free to “upload/import and print the 500 Byte Data Exchange File”. 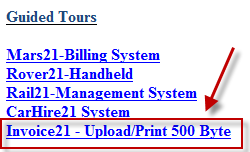 When you go to the website, under the Main Menu on the left, click the Invoice21 link. Sorry, meant to type Railinc. Since this article, the installation of the runtime engine has been improved. It no longer requires any modification of any kind. Just install it and you are ready to go! Also, it should be noted that the software now works only on Windows Vista or Higher, this includes Windows 10. Thanks for the update! I look forward to giving it a try.